E-Thyroid provides an assessment of thyroid lesions by incorporating an index for suspicious areas. E-Thyroid images are generated using pulsations from the adjacent Carotid Artery, eliminating the need for manual transducer compression and offering greater consistency. 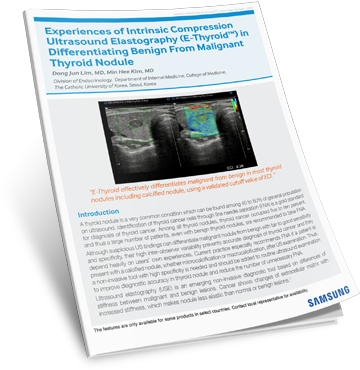 This white paper will review examinations performed by endocrinologists with one or two-years’ experience in ultrasound elastography (USE), using Samsung’s RS80A equipped with E-Thyroid software.